Work for Goodwill and Make a Difference! Goodwill is hiring at multiple locations! 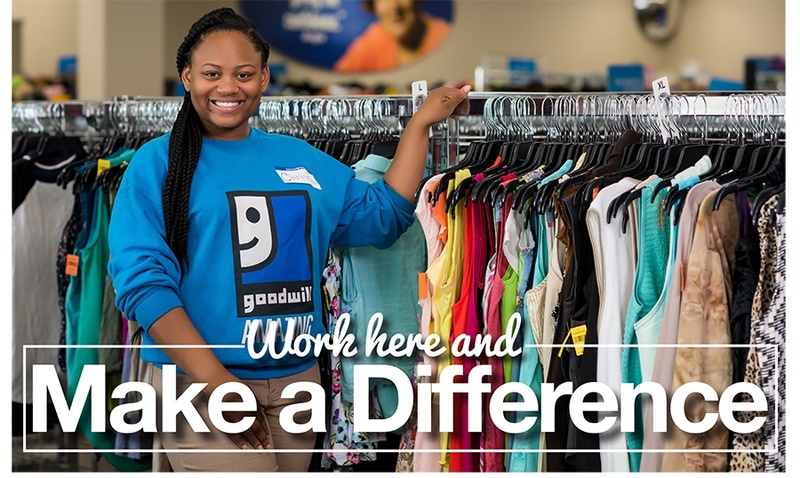 No matter what job you have at Goodwill, you’ll be part of a team that makes a positive impact in the lives of individuals, their families and the communities where we operate. We made it to SPRING! Club Goodwill REwards members take $5 OFF your purchase of $20 or more on Wednesday, March 20! Join Judy Pielach for a Spring Fling at Goodwill! 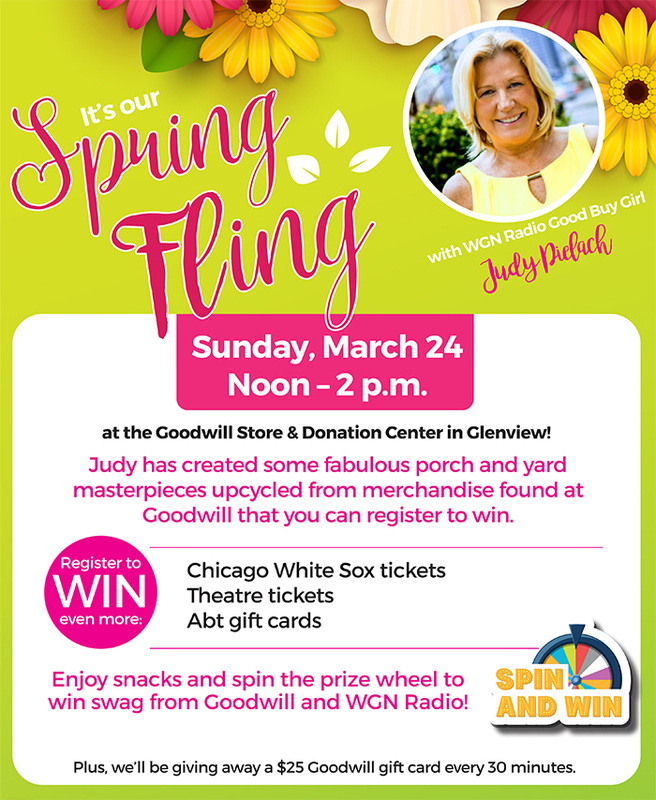 We're having a Spring Fling at the Goodwill Store & Donation Center in Glenview on Sunday, March 24 from noon until 2 p.m. Stop in to meet WGN Radio Good Buy Girl, Judy Pielach and check out some of her fabulous porch and yard masterpieces upcycled from merchandise found at Goodwill. You can register to win Judy's creations as well as Chicago White Sox tickets, theater tickets, Abt gift cards, plus we'll be giving away a $25 Goodwill gift card every 30 minutes! We're Having a Pi Day Flash Sale! Attend a Hiring Event in Menomonee Falls! Are you looking for an amazing career opportunity? Then check out our hiring event on Wednesday, March 13 at our Goodwill Store & Donation Center at W178 N9315 Water Tower Place in Menomonee Falls from 5 to 8 p.m. We're looking to fill multiple team member positions! On the 15th of every month we celebrate YOU—our Club Goodwill REwards members! So shop Goodwill Friday, March 15th and save more when you spend more! Spend $15, save 15%. Spend $20, save 20%. Spend $25 or more, save 25% on your total purchase! Plus, when you spend $15 or more (after all discounts have been applied and before tax) on the 15th, you’ll also receive a coupon good for 20% off your total purchase when you shop on the 16th, 17th and 18th! Are you looking for an amazing career opportunity? Then check out our hiring event on Tuesday, March 12 at our Goodwill Store & Donation Center at 761 S. Midlothian Road in Mundelein from 10 a.m. to 4 p.m.
Sign Up for Club Goodwill REwards Text Alerts Now! Receive special text offers and information from Club Goodwill REwards through your mobile device NOW! Text JOIN to 31823 to receive a maximum of 5 text messages per month. Message and data rates may apply. Glenview Goodwill Store & Donation Center is Open Now! Our newest Goodwill Store & Donation Center at 2740 Old Willow Road in Glenview is NOW OPEN! Stop in and shop with us today! Goodwill not only offers top quality, gently-used clothing, furniture and household items, but we also provide an assortment of new, never-been-used items!